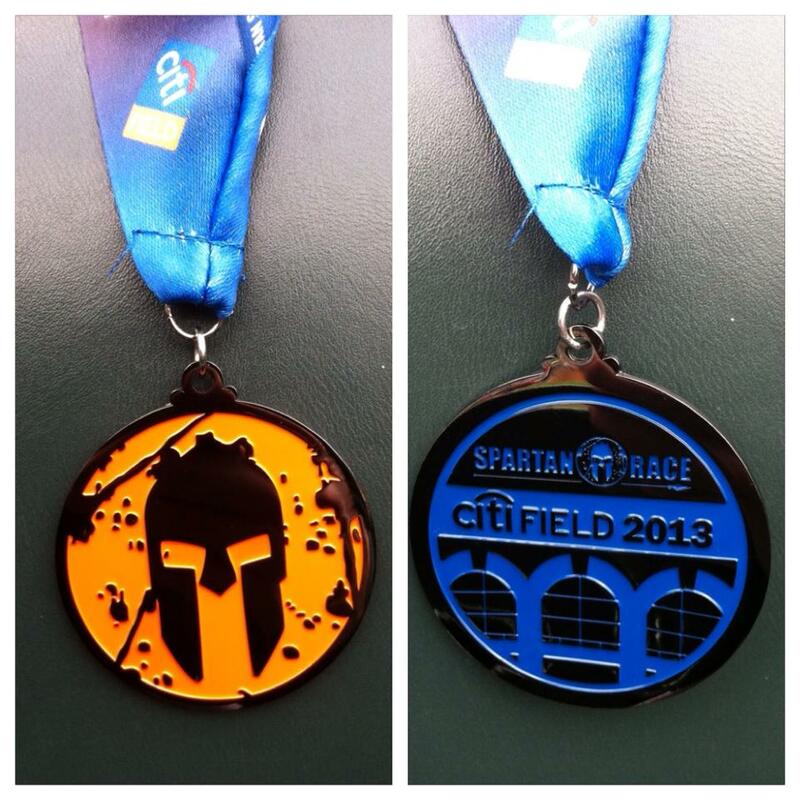 Citi Field is the second Stadium event Spartan Race has put on to date, and I wasn’t going to be able to attend – so I checked in with the team, and Kay offered to write a review for us. 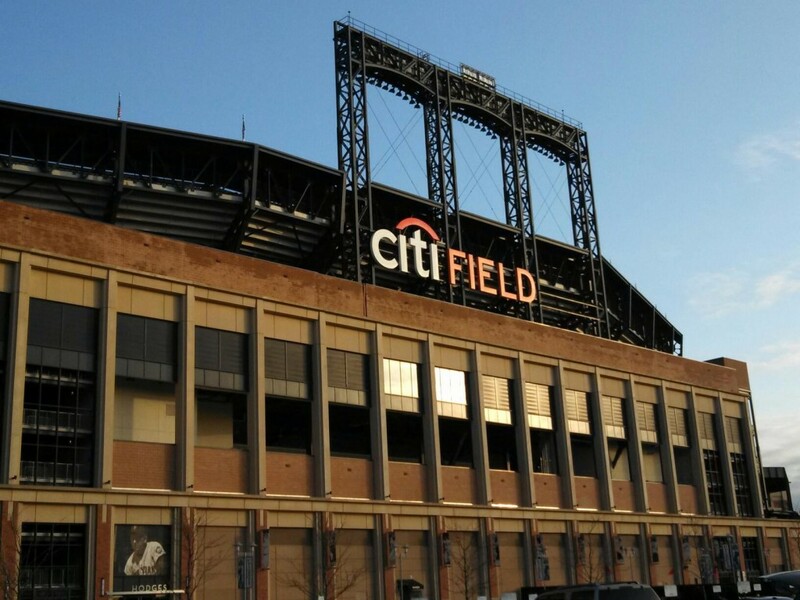 The first stadium series event of 2013 was held at Citi Field (where the Mets play) in Queens, NY. I went into this event thinking that it would be similar, if not the same, as the Time Trial held at Fenway Park in November. I was right, although there were some differences between the two, which I will detail below. My only goal going into this was to decrease my time from Fenway, which I succeeded in doing by shaving ten minutes off of my time. I was able to run two laps, one with the Reload Fitness team, and one with James’ friend Mike, whom I had just met a couple hours prior. The start line when I went through the first time was a mad house. They didn’t have anyone asking for wave times and putting those people in a corral like at Fenway, thus creating a huge mass of people at the start, which didn’t move for minutes at a time. We stood there for over an hour before we got up to the actual corral. The second time, there was hardly anyone there and we went right through. Bungee cord crawl – Up the ramps, like at Fenway. Over some, under others, seemingly endless and zaps all your energy. Rowing station – Jump on the erg, if you don’t mind waiting in an epically long line, and row your heart out for 500 meter in less than two minutes. I burpee’d out on the first lap due to the lines, but made an attempt on the second lap, failing with one stroke left. I did not, however, fly completely off of the seat this time, so at least I made progress. Ball slams – Lift overhead and slam down 20 times. Fifteen pounds for the women, not sure how heavy they were for the men. Rope climb – On the first lap, only the women could use the knotted ropes. On the second go around, they told the men they could use the knotted ropes, but that they had to wait in the line (they were long as they only had 4 knotted ropes as opposed to 6 sans knots). Jerry can carry – Again, some discrepancies between laps…first lap, everybody carried one jug, while on the second lap, the men had to carry two and the women just had to carry on. Up and down multiple flights of stairs. Saw lots of people emptying their cans out at the bottom and lots of people taking half empty cans to start with. Hercules hoist – Higher than normal, like at Fenway. Not sure of the weights though. Jump rope station – 50 times while trying not to get rug burn or whack yourself with the thick battle ropes. Monkey bars – Not a solid bar, you had a smaller bar for each hand with a beam in the middle and some of them spun. Failed on the first lap with two rungs left, but nailed it the second time! 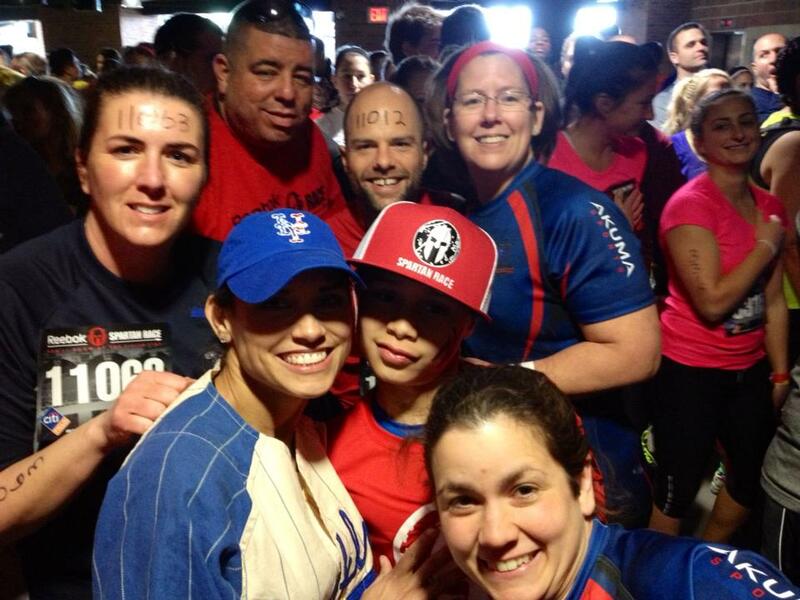 Sandbag carry – Not the giant, 60+ # ones we had at Fenway, just the normal pink for females and red for males. The line was huge for the women, so I just took the men’s sandbag both times, catching crap from the volunteers each time. Pushup station – Hand release pushups in a hot, stuffy locker room. VERY small space that could fit maybe 20 people max. Atlas carry – Pickup stone and carry maybe 25 feet away, drop it, do 5 burpees, then pick it up and carry it back to the start. Again, not sure of weight. Hobie hop – Strap a rubber band around your ankles and hop up four flights of stairs. Once you get to the top, take off the band and go back down to the start. No lines during the first lap, huge line during the second lap. Spear throw – Not sure what happened on my first lap, but the spear throw was broken, so everyone was told to just completely skip it. Line on the second lap was ridiculously long and I seriously thought about burpee-ing out of it to save time…and I should have since I failed it anyway and had to do 30 burpees. Traverse wall – They tried something different this time, using pegs instead of blocks. However, they apparently didn’t realize how much longer it would take people to complete, so a few heats into the day, the normal blocks were screwed onto the wall. They kept the back two walls with the pegs, but lines were long both times I went through (I used blocks on both passes through) and I heard they ran out of pegs at one point. Walls – Short walls, tall walls, over-under-through walls. You name it; they had it, minus the slippery wall, of course. The first wall you come to after the bungee cord nonsense at the beginning, maybe four feet high, had an unnecessary line on my second lap as they were only letting two people go over at the same time and if you needed assistance, you could only use the left side, and only the volunteer could help you, not a racer. Really? Cargo net – Used a webbing instead of their normal rope cargo net. Loved it, but bottlenecks at the top where people were transitioning. Box jumps – Don’t know the heights for men and women, but ten jumps. Couldn’t go over and back like at Fenway as they put the boxes right up against a fence. No ladder walls, no tubes to hurdle, no ten burpees to start off. Reebok finally made an appearance at the merchandise table, though I was pleasantly surprised. They have some really new Reebok Spartan Race tech stuff: capris, sports bras, shirts, running shorts, etc. The Citi Field hoodie was nice too, not just because of the THUMB HOLES (Sorry, Vince, I HAD to mention them), but because of the general comfort of it, though the price was $10 higher than the same exact hoodie from Fenway. Spectator viewing area was okay. Other than the finish line area (cargo net, box jumps, gladiators), you didn’t really get to see much, except for a far view of the sandbag carry. A bit crowded at times, but as a whole, the event was severely disorganized so I’m honestly not surprised. I think they overcompensated for the fact that they weren’t having a Sunday race at this location by overselling the event. TEN THOUSAND racers is a bit much, especially when you add all the spectators to that number. I was lucky to have been up in the Racetag suite for most of the day, away from the crowds, but just being down in the breezeway/stands between heats was enough to annoy me. Liv did the .5 mile kid’s race, which I was really unhappy with. They didn’t have the course marked that well, part of which went through the stands in the spectator area, which meant that parents/spectators were literally on the kid’s course and refused to move, creating a giant, confusing cluster of chaos. I won’t touch on Liv’s performance, but I will mention that there were barely any obstacles for the kid’s race; the race consisted mostly of stairs, which is a little hard for 4-7 year olds. They ran out of the orange kid medals, so Liv ended up with the regular adult medal. I was more impressed with the mini course at Ruckus this past fall, to be honest. They seemed more organized at other races I’ve been to, so not sure if this is just because of the restrictions set by Citi Field or if they just didn’t utilize the stadium that well. I didn’t see the kid’s set up at Fenway, so I can’t compare the two in that respect. In conclusion, I loved the course itself (and the bling), but I was really disappointed with the lack of organization on all fronts, especially with what I felt was a great set up at Fenway. I could have shaved many more minutes off of my time if I hadn’t been stuck waiting in lines. You should never have to burpee out of obstacles due to a wait. I really hope they employ the fast lane for the remainder of the stadium series events as it helps immensely, both with passing slow people on the stairs (which just wasn’t possible here with only two lanes) or breezing through the obstacles. Either way, I’m excited for Citizen’s Bank Park in Philly in August! Also, I should note that if you complete all four stadium series events (NY, WI, PA, and MA), you will earn a Season Pass J Not sure if this has been made public knowledge to those who weren’t at Citi Field, so I figured I would pass the information along. One correction to the season pass for completing the stadium series – you have to do ALL the stadiums and there are more to be announced. If you do just the four that are already on the schedule, you will not get a season pass.